A few weeks ago I returned from a trip to Brazil. With the season over for the summer in Europe, I wanted to keep active. 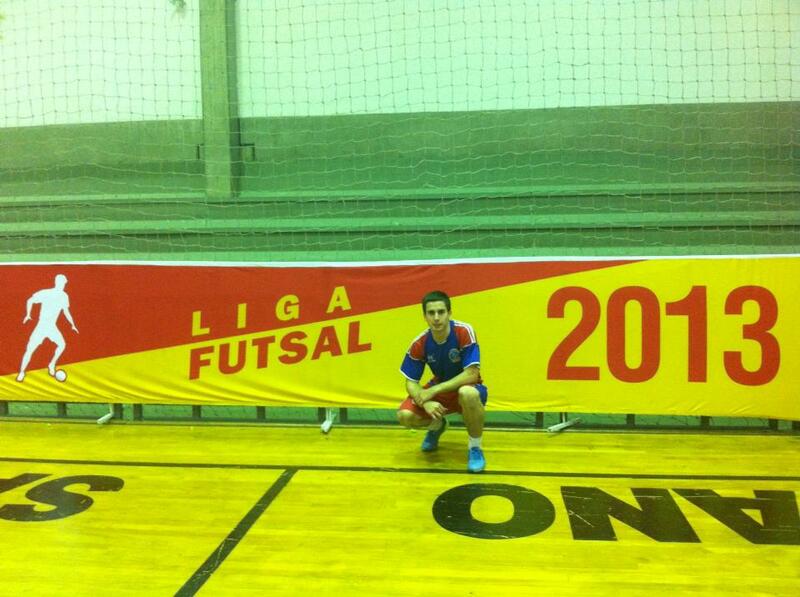 At that time it is the middle of the Brazilian season so I decided to go there so I could train with top players but also to experience the sport in the country that has the greatest futsal history. While I was there I saw games from all levels, including men’s and women’s as well as seeing training sessions at different age groups plus amateur matches. Below is a report on the trip. I went to visit a team in Sao Caetano which is a city adjoined to the huge metropolis of Sao Paulo. This is a region that is a hotbed of futsal, with several top sides in close proximity. The city of Sao Caetano has a strong history in the sport. They had a team called General Motors in the early part of the last decade and it was one of the best teams ever seen in the history of futsal with players such as Betao, Falcao, Lenisio, Manoel Tobias, Schumacher, Simi, Vander, Vander Carioca and Vinicius all at the same club. Many great players and internationals have played for the team I trained with, Sao Caetano, such as Alemao, Betao, Lukaian and Simi. Several top players started their careers in the youth section of the club such as Eder Lima (Russia), Lukiain, Pula (Russia) and Fortino (Italy). They have teams from U6s all the way to U20s and the 1stteam. In addition they have a women’s side. The U18s, U20s and 1stteam, for both male and female, train every day. The game is played very differently in Brazil to what I have experienced in Europe. It is more physical and faster. There is little change in rhythm and the tempo remains high all the time. Teams usually play with a pivot, adopting either a 3-1 or 2-2 system. Their understanding of how to play with the pivot is excellent. You see quite a lot of dribbling and the average number of touches per possession for each player is quite high. With regards to defending the teams are usually using an individual defence with not too much collaboration. Most teams are pressing high and strongly. In Brazil blocks are illegal and I think this is the reason most corners I saw were not played directly into the area. Sao Caetano’s current head coach, Lucas Chioro, was the former assistant to PC Oliveira, who won the World Cup with Brazil in 2008 and is considered the best coach in Brazil. He had also previously coached Sao Caetano. He was using exercises similar to those used in Spain, mostly utilising integrated training and working decision making. I enjoyed the training a lot. At my first session they were calling me “Falcao”. You are probably thinking this is because the way I play futsal shares similarities with the legendary Brazilian player. However they were not to know this as I was yet to touch a ball. I realised the actual reason was just because my training kit had number 12 on it. Once training started I never heard them call it me again! At first it was difficult to get accustomed to the different rhythm of the play and how physical it was. I would often watch the first few minutes to get an idea of the exercise and then join in so this added to the difficulty of catching the rhythm. However I was confident I could adapt and every session I improved and by the end I was playing well and comfortable in the sessions. Towards the end of my trip all the local senior teams were traveling away (they usually travel together) and wouldn’t return before I left so without anyone else to train with I spent a couple of days with Corinthians U20. They train twice a day and the club provides food, accommodation and a salary for the players. They are one of the best in the country at this age group (they just won the national U20 Championship) so it was a great chance to see what the next generation of Brazilian players are like. I was very impressed. They were some players with amazing technique and they play at the same high tempo that the senior players do. Tactically they were not so developed and sometimes the game was very individual with the only solution being 1v1s to create something. One youth coach commented on the need for the players to be taught more tactics in Brazil like in Spain. My view is there needs to be a balance as too much focus on systems and performing tactical movements at youth level can be detrimental, as I have seen sometimes in Spain. First of all you need the technical foundations to build the tactics on or otherwise they are pointless. For example, there is no point knowing what to do when the pivot has the ball if the players don’t have the technique to make the pass to the pivot. Secondly there is a risk that with teaching a lot of tactics to young players they can imitate the tactical action but don’t possess the essential understanding of why and when to do it. During my month there I did not see so much street futsal being played. It does take place but my expectation was there would be much more and that it was the basis for why they are developing so many talented players. Speaking with people they told me that futsal was played mostly within the schools and every school has a court. This would correlate with other successful futsal nations around the world. Also in Spain every school has a futsal court. In Iran, which shares little culturally with Brazil and Spain but is one of the top futsal nations, 9.5 million of their 12.6 million students are playing futsal. Maybe then it can be concluded that futsal in schools is the key to developing elite futsal players and that increasing this should be the aim of developing futsal nations. In Brazil players play futsal until they are about 12 when they can make a choice whether to stay with futsal or play football. Some clubs, such as Santos, specifically use futsal in their youth section for developing their football players. This is the club that in recent years has developed players such as Robinho, Ganso and Neymar. Here is a video of the atmosphere at an U17 cup match. In Brazil, until 1996, futsal was played with a much heavier size 2 ball at all ages. They also used to play on much smaller courts (like basketball courts) but now there are many larger courts. In Spain they do not have this history and the popularity of handball has meant they always had larger courts. I think this could be part of the reason why Brazilian players have historically had such superior technical ability and it will have to be seen whether this change impacts this. In Brazil they have a separate federation for futsal, though a relationship exists with the football association, which means the ultimate objective of the organisation is to develop futsal. In football federations the people in charge of futsal often have no interest in the sport and only wish to protect their position, progress would affect the status quo and they may be replaced with more knowledgeable people. If we have a separate federation there is more chance that these people have an interest in the development of futsal. They have the same structure in Spain and Russia which along with Brazil are the three best leagues in the world. A separate federation was probably created because the sport was popular in the first place but I think there is a correlation with their subsequent success in developing futsal and this separation. Within the clubs I saw the same problems (I wrote about this here) I have seen in clubs across the world. There is a lack of marketing and promotion and there can be no long-term planning because the funding comes mainly from the local government and is only allocated on an annual basis. One of the best teams in the country and the world, Intelli, are without a major sponsor. Outside of futsal I really enjoyed experiencing the Brazilian culture. The people are very warm and made me feel very welcome. My impression was also that they are generally quite happy people. The riots surprised many people because generally Brazilians are not interested in politics so much and maybe this was a source of their happiness! The food in Brazil is amazing with their diverse population bringing influences from around the world. After a month of speaking Portuguese, I wasn’t speaking English at all, it was coming along quite nicely and in Milan I had some problems speaking Spanish because the Portuguese words kept coming in my head. Overall it was an incredible trip and I met some great people (including players such as Lenisio & Schumacher) that I will keep in touch with. I hope to return soon. Many people helped make this trip really special. However there were a few that I am especially grateful to; Andy Reading for putting me in contact with the club, my Mancunian friends Adriano and Rodrigo for showing me around Sao Paulo, Laercio De Graca for allowing me to be part of such an excellent club and finally his son Daniel who was incredible in all the help he provided me with. Thank you guys for the huge effort you made for me. I am now in Kuwait ready to start the Mini Club World Cupwith Croatian side Alumnus. You can find out more about the tournament here or download the mobile app called KMWFCT. I am really looking forward to it and I am sure it is going to be a great tournament.